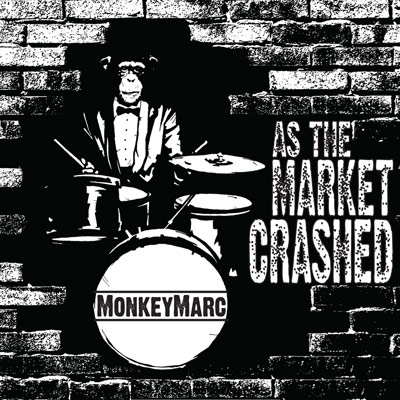 As the Market Crashed by mOnkeymArc (Combat Wombat) is the result of years spent listening, absorbing and producing forward- thinking music. Recorded entirely on solar power in his converted shipping container studio in Melbourne, mixed in Paris at Sumroom Studios and Melbournes Headgap Studios and mastered in London at Transition, this album takes influence from a worldly palette exposing the listener to a diverse and eclectic musical journey unlike any Australian artist yet. With influences reaching into the crates of hip hop, dub and dubstep this release is as much an ode to the past as it is an optimistic exploration into the future. With sounds reminiscent of early Dj Shadow, Dj Spooky, J Dilla and Flying Lotus, it is also equally influenced from further afield with more dub aesthetic acts like African Head Charge, Tackhead, Burial and Kode 9. Underpinning the album is a strong message for social and environmental change, drawing upon samples that cover the global financial crises, the inequality of political systems and the world's addiction to fossil fuels. These vocal insights add a dynamic layer to the massive futuristic basslines which go head to head with brooding instrumental beats and crusty old samples in a truly organic and original style. The first half of the album draws heavily from a hip hop aesthetic. There are elements of blues, jazz and world music scattered across instrumental beats that take the listener on journeys to far and distant lands. The second half of the album ventures into deeper dub orientated territories relying on massive bass lines and shimmering stepped out rhythms. Samples of records from yesteryear come drifting in and out creating diverse and thought provoking music. This album is a truly unique contribution to the Australian electronic music scene.